Mike Mcwilliam gave a talk and showed a film on the Newburgh Reed beds. His personal involvement soon became obvious as he appeared on the film made in about 1984. Mike grew up in Africa and entered the Royal Agricultural College in 1970. It was from here that he came north to manage Reedways of Errol in 1977 eventually becoming a director of the company and spending ten years there. Although he then spent the next twenty-six years as general manager of Morris Leslie Ltd his heart has always been in the work he did at Newburgh. Mike explained that the Newburgh reed beds had been planted by the Napoleonic prisoners of war some two hundred years ago in order to prevent further erosion by the River Tay. The reeds are then harvested to provide quality thatching for roofs. There are now some fifteen hundred acres in the area. The reeds are cut in late March to encourage new growth and Mike has been instrumental in developing new machinery for refining the reeds and bulk handling. His film showed the range of equipment used on the reed beds. The demand for reeds has declined since thatching has not created the apprenticeships required to bolster the business. Thatching, which lasts about forty years, is still used in some areas of the country but reeds also now come from China and Poland. The cutting of the reeds continues under the RSPB who have discovered that thinning out the reed beds encourages birds to nest. Reducing the amount of old growth also reduces the extreme fire hazard. 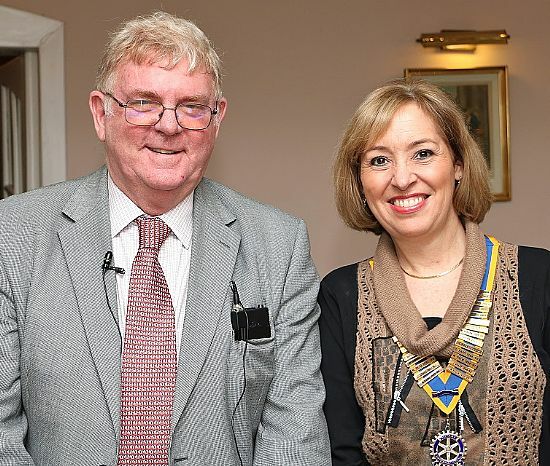 President Gillian warmly thanked Mike for his talk and for his personal donation of one hundred pounds towards the Tayside Challenge.